There certainly was no time to skip downtown, either, for post-workout drinks. Fabio Capello, who signed on with the Russian Football Union last July, has tightened the screws on a squad that earned its country’s ire at Euro 2012, both for their disappointing group stage exit and media reports of pampered footballers run wild in Warsaw. Sergei Ryzhikov, the national team’s third-string keeper, shocked journalists recently when he claimed that Capello was even stricter than Kurban Berdiyev, the straight-laced Rubin manager hailing from Turkmenistan. The reports leaking from national team training camps back the goalie up. In addition to no-nonsense training, players are restricted to the floor of the hotel on which they sleep, with trips into town off limits. Mandatory 8:30 am breakfasts are another innovation. Journalists grumble, too. Capello frequently limits access to practices and forbade the media from seeing the team when it initially arrived at The Grove, their fancy suburban hotel. Kokorin still manages to keep the fans back home happy with the help of the Internet. Roman Shirokov, Zenit’s outspoken midfielder, snapped a pic of the birthday boy at camp on Monday, generating a thousand likes on his Instagram account. Two days earlier, of course, Dinamo hooligans had snuck onto the club’s Moscow Region training camp and opened fire on the players from paintball guns as punishment for their embarrassing start to the season. Kokorin hit back that Dinamo, unlike Zenit, never got any help from the officials (Zenit won 1-0 at Kuban that weekend thanks to a highly controversial Kerzhakov penalty… an officiating decision that Russia’s head referee Roberto Rozetti critiqued again in a recent interview). Shirokov and Kokorin find the dialogue amusing, and it’s well-received by most, given their light-hearted approach to Russian football’s constant scandals. Over winter break, though, Kokorin sent the Russian Internet into a frenzy after affectionate pictures of him and Pavel Mamaev, a 24-year-old CSKA midfielder, suggested there was more than just a friendship between the two. Given Russian society’s public hatred for homosexuality, particularly in football’s male-dominated circles, it’s unfathomable that Kokorin and Mamaev would have taken the pictures if they did, indeed, like each other. Still, the faux expose certainly knocked Kokorin down a few pegs after a brilliant fall campaign, and crude jokes will likely accompany him the rest of his career, at least on Internet forums. 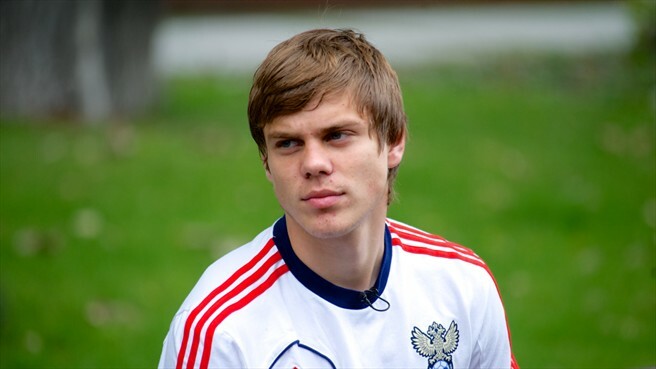 Christmas in Miami, tabloid gossip and even jokes about his uncanny resemblance to Justin Bieber are a far cry from Kokorin’s childhood in Valuiki, Belgorod Oblast. Though Kharkov is just over the Ukrainian border, the small town is hours from Voronezh, the nearest big Russian city. For an aspiring young footballer, even Voronezh could offer little hope for a future. The only decent Russian academies within an 800-km radius were in Volgograd, Rostov, or Moscow. The capital may have been the most distant, but it had by far the best options, so 9-year-old Aleksandr went north in 2000, settling at Lokomotiv Academy for seven years before making the switch to Dinamo at age 16. For years, he would see his parents once every three months and got by on the meager allowance and furnishings provided young academy players. Kokorin, oddly enough the Internet’s whipping boy these days, has said technology and better living standards make it harder for kids to develop their talent nowadays. Talking about life before the Moscow move, “We were thrilled whenever we could get on the pitch. We were always getting chased off. Now, all that young guys think about are these endless gadgets, telephones, tablets.” It’s somewhat amusing coming from a 22 year old, but it’s certain that Kokorin had to work hard to become one of Russia’s brightest talents. On his own in the grasping, merciless megalopolis, the young Valuiki native led his Lokomotiv academy mates to multiple city championships, earning praise as the top young footballer in the capital and his jump to Dinamo over salary disputes is still a bitter pill for Lokomotiv fans and execs to swallow. The question now, of course, is how long the versatile, prolific forward will stay with Dinamo before going abroad or taking another big pay raise to sign with another Russian club. Though international demand is still muted, pressure on Dinamo to sell will grow each season. Kokorin’s bagged 12 goals in 22 club appearances since last summer, while starting in Russia’s final three World Cup qualifying matches in 2012. He’s almost certain to get the nod against Northern Ireland today, despite a scheduling flap between his club and Fabio Capello, which saw Kokorin, along with teammates Anton Shunin and Vladimir Granat, left off the national team for an Iceland friendly in February. 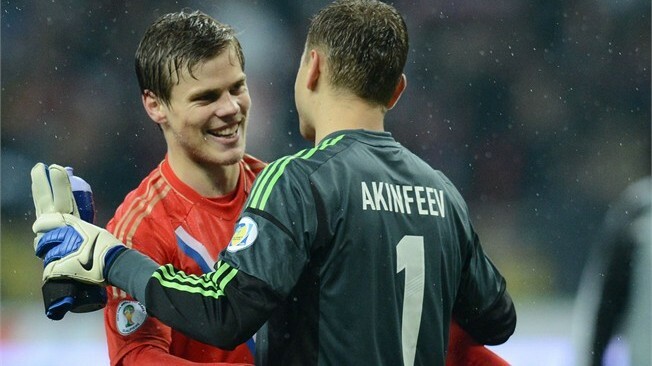 Kokorin, indeed, unlike CSKA’s own explosive, precociously talented Alan Dzagoev, has come into his own under Capello. Though expected to see a fair bit of time on the pitch at Euro 2012, he enjoyed only six minutes of play in the 4-1 romp over the Czech Republic before an injury sent him home prematurely. He’s only scored once in WC qualifying, in Israel, but he was an unstoppable force for Russia’s U-21 squad in 2011, finding the back of the net five times in his final three appearances under Nikolay Pisarev. Last Saturday, he helped his team earn a draw in Krasnodar, pounding a powerful header past Kuban keeper Aleksandr Belenov for an early 1-0 lead. Back in November, his head coach Dan Petrescu, told the media Kokorin “needs to work and work” to be considered on par with Zenit forward and national team leader Aleksandr Kerzhakov. On Thursday, Petrescu predicted the Russians would defeat Northern Ireland 2-1 and that Kokorin would score both goals. Petrescu’s compliment reflects the growing excitement around Kokorin’s future, certainly at his club, but, more importantly, on the Russian national team. He made an enormous leap forward last fall, doubling his offensive output from the 2011/2012 season in half the games, while latching onto the national team. It’s going to be a sloppy, wintry pitch in Belfast, but Kokorin and Russia, a few snickers aside, hope this spring brings another jump in his development. If all goes well, now and in the future, Aleksandr may well become the face of Russian football. With World Cup 2018 looming, that would be no small honor. Three points are vital for Russia. Though they hold a four-point lead with a match in hand over Portugal in the group, a slip-up in Belfast would make the trip to Lisbon in June a little more nerve-wracking, Capello has called this game the most important encounter of the World Cup 2014 qualifying cycle, so you can bet that he has no interest in experimenting with the squad. Igor Akinfeev (g); Aleksandr Anyukov, Vasili Berezutski, Sergei Ignashevich, Andrei Eschenko (d); Igor Denisov, Viktor Fayzulin, Roman Shirokov (m); Aleksandr Kokorin, Aleksandr Kerzhakov, Vladimir Bystrov (f). Dmitri Kombarov coming on for Anyukov, Alan Dzagoev replacing Fayzulin and Aleksandr Samedov subbing for Bystrov. As for club representation, Akinfeev, Berezutski, Ignashevich, and Dzagoev play for CSKA, Anyukov, Denisov, Fayzulin, Shirokov, Kerzhakov, and Bystrov suit up for Zenit, Eschenko – Anzhi, Kokorin – Dinamo, Kombarov – Spartak, and Samedov – Lokomotiv. Pitch conditions in Belfast are so miserable that UEFA postponed the match to Saturday. If the weather does not cooperate, it’s possible that this tie will be pushed back to an even later date. Russian, meanwhile, are scheduled for what might now be a very quick turnaround, as they face Brazil in a friendly at Stamford Bridge on Monday. This entry was posted in Player profiles and tagged aleksandr kokorin, dan petrescu, dinamo moscow, fabio capello, northern ireland, russia, russian premier league, world cup 2018, World Cup Qualifiers by Andy Shenk. Bookmark the permalink.